Kenlake State Resort Park is one of my favorite places in all of Kentucky. There’s just something about it that gets to me. When I was looking through my pictures of Kenlake State Park earlier, one of the reasons I love it so much occurred to me. It’s a crazy cool contradiction and I get a big kick out of its contradictory ways!Ã?Â Take a look at Kenlake Hotel in the picture above.Ã?Â This is Kenlake State Resort Park’s lodge. As you can tell, she has a lot of character and more than a little history to tell. Driving up to the white stucco hotel (lodge) never fails to leave an impression on me. It’s as though you’re driving a little into the past.Ã?Â It looks like a hotel my mom and dad would have stayed in before I was born. Given the fact that Kenlake State Resort Park opened in 1952, it makes perfect sense that you feel a little sweet nostalgia.Ã?Â I get a huge kick out of it and I wasn’t even born in the 50’s, so I can only imagine how special it is for those who were.Ã?Â Even the beautiful… let’s make that gorgeous… flower gardens that surround the hotel are reminiscent of a time when people took more pride in landscaping and seem to get a huge kick out of working alongside Mother Nature to create magic. The rooms in the hotel have been updated. In fact, as soon as you enter the hotel, it’s as though you leave the 50’s behind. It’s a beautiful lodge – inside and out, the inside simply looks more modern than the outside. You can walk down to Kentucky Lake behind the lodge.Ã?Â The entire setting is absolutely beautiful. 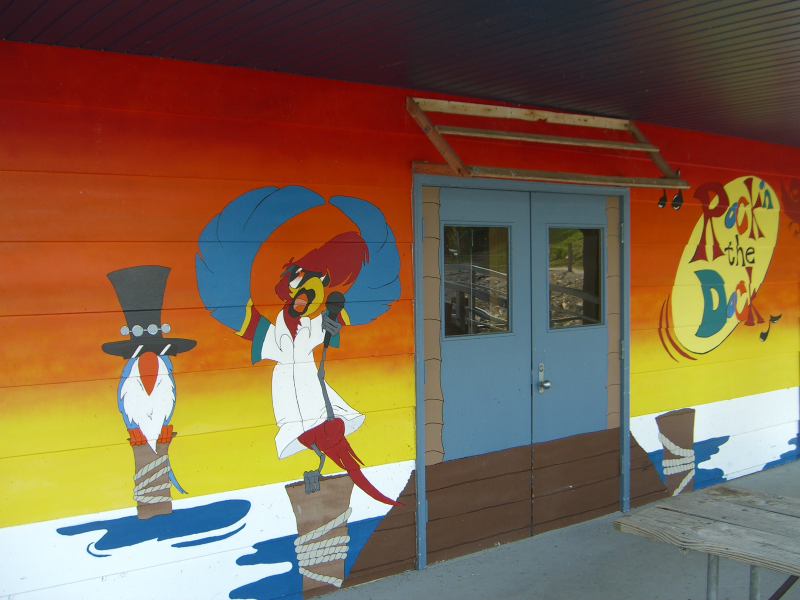 When you drive around Kenlake State Resort Park, you’ll be struck by the wonderful bluesy artwork – a tribute to the Blues, something Kenlake’s wild about. This is another beautiful contradiction.Ã?Â Kentucky’s known, of course, for bluegrass music – as well as country music.Ã?Â Kenlake reminds us that Kentuckians also love, love, love the Blues.Ã?Â Ã?Â In fact, Kenlake State Resort Park’s famous Hot August Blues Festival attracts thousands of fans each summer.Ã?Â The art (including a really cool sculpture in addition to paintings that memorize me) pays homage to the wonderful Blues. The art’s almost as beautiful as Kentucky Lake, but not quite. That’s okay, though, there’s no shame in coming in second to the master Artist. 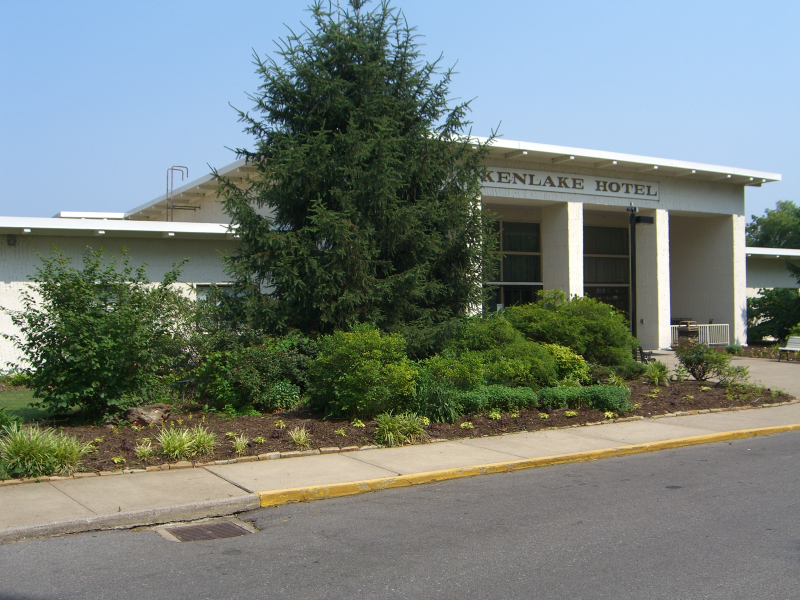 For more pictures of Kenlake State Resort Park, click the link. Then go to Kenlake State Park and take better pictures, yourself! My family loves, loves, loves great pizza. Seriously, when we’re in one of our favorite pizza restaurants, you should see us. We inhale the aroma, discuss toppings as though we’re scientists curing the common cold, drool over appetizers and all but fondle the Parmesan cheese and crushed red pepper bottles. We’ve never done that. Not once. I promise. Like most people, we have a few favorite places we hot foot it to when nothing but pizza (or a Stromboli) will do. 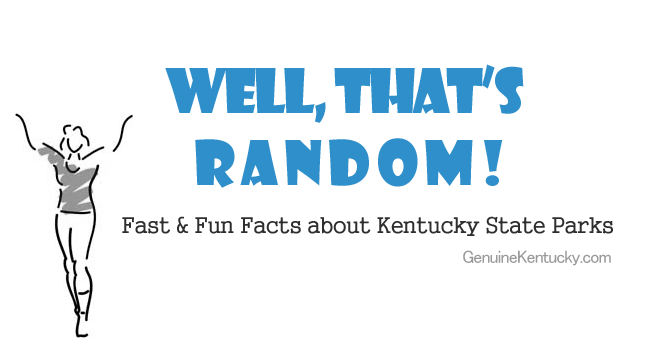 One of these favorite pizza restaurants is in Robards, Kentucky – a short drive from Owensboro, Henderson, or Madisonville. The name of the restaurant is Rockhouse Pizza and, trust me, pizza doesn’t get any better than this. My husband (Michael) is as huge on Strombolis as the rest of us are on pizzas and he gives Rockhouse Pizza the greatest compliment in the world for their Strombolis. He says they’re the best in the world. Well, his words were actually on the planet, but the boy has never left Earth – to the best of my knowledge – so I’m going with the best on Earth. He’s always been exceptionally partial to Rockhouse Pizza’s Strombolis. The only time I ever heard him like anyone’s as well was at Harkley’s in Owensboro, which has SADLY closed (not the first business killed by a crummy location). Harkley’s pizza was also as good as Rockhouse Pizza’s. Thank God for Rockhouse – otherwise the mourning for Harkley’s would be unbearable! If you’re older than 30, think back to the pizza restaurants you loved growing up. The home style pizza restaurants that just, somehow, felt like home away from home. Michael and I talk a lot about the Pizza restaurants we loved in Madisonville when growing up. Pizza House on Center Street was always like stepping into Heaven and letting God’s personal Italian angels make pizza for you. I haven’t been in years, I only hope it’s still as wonderful. I can say this with absolute certainty, though: Rockhouse Pizza makes you think God has Italian angels in Robards as well. When you think back to the pizza restaurants you loved while growing up, don’t let the nostalgia make you sad – at least one such pizza restaurant still exists! As soon as you walk into Rockhouse Pizza, you’ll think you’ve entered a time machine and gone back to the way pizza restaurants are supposed to be. If you love Strombolis, you’re also in luck. Rockhouse Pizza makes outstanding Strombolis. Be aware, however, that you don’t get chips with the Stromboli like you do in larger restaurants. You can, however, ordered some outstanding fried mushrooms as a side. They used to serve wonderful onion rings which our server informed us are a thing of the past. They’re still listed on the menu, but you’ll be disappointed if you try to order them. Not a biggie, the fried mushrooms are fantastic. Put a little salt on them and you might not even need the ranch dressing dip that comes with them. They’re really, really good. It’s between Madisonville and Henderson. It’s a short drive from Owensboro. I could eat their pizza ever single day. 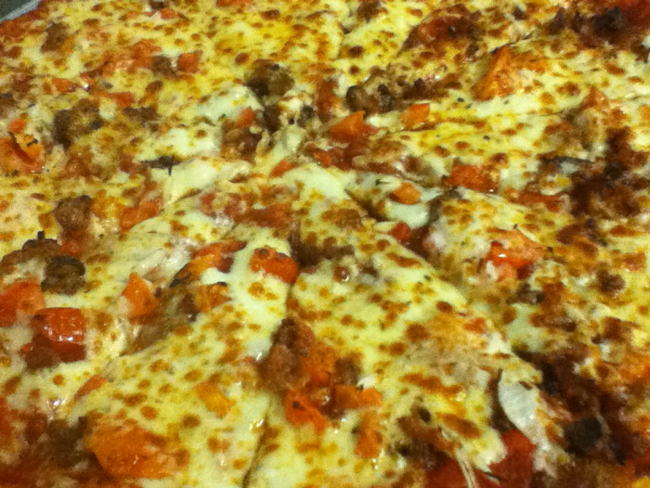 Rockhouse Pizza is open for lunch and supper, Monday – Friday 10:00 am – 9:00 pm and Saturday 11:00 am – 9:00 pm. Rockhouse Pizza is a proud supporter of local schools, businesses, animal shelters, and charities. Our family friendly restaurant also offers free wifi internet and is decorated in an antique theme! Come check us out, we look forward to seeing you! Rockhouse offers a large selection of delicious thin crust pizza’s with tons of toppings and sizes 7″ personal size to our large 15″ to choose from. We also have the World’s Finest Stromboli’s, which are a favorite with customers. Also available are a variety of appetizers, salads and sandwiches. Can’t decide which appetizer to order? We offer a sampler that has a little of everything. However, you can’t go wrong with our buffalo wings. 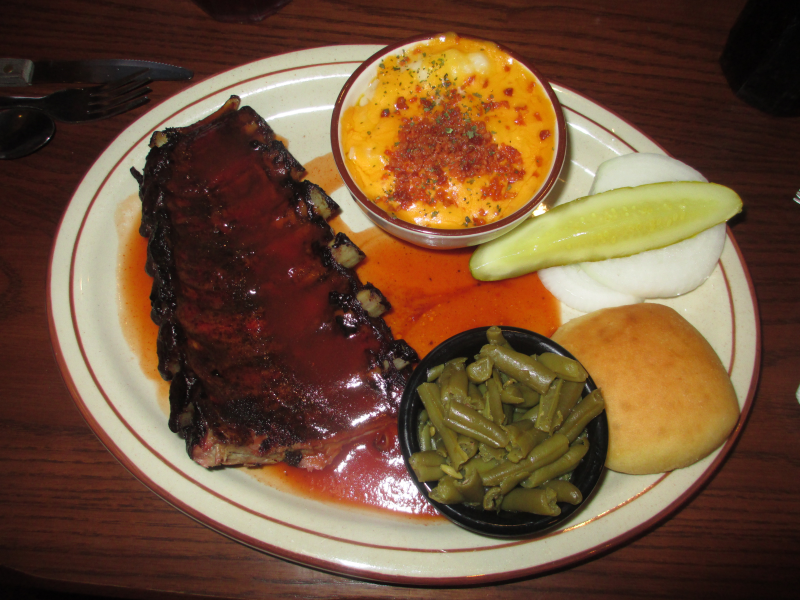 Seasoned just right for those who don’t like it too hot or add our hot sauce to them to give them a big kick. They are served with fresh cut celery and our own special wing dip. We also offer boneless wings. Once you try one, you will always want more. Straight from our Research and Development department is LASAGNA! Homemade and fresh. Guaranteed to fill you up. We have daily specials for dining room and carry out pizza specials on Tuesday, Friday, and Saturday. And for those who just can’t seem to make up their mind on what pizza they want, we now offer pizza buffet.Our buffet is offered Monday – Saturday starting at 11 and ends at 1:00 pm depending on customer demand. So if you keep coming in, we’ll keep it open! Who else does that? We also take reservations for the dining room if you need a place to celebrate a birthday, holiday get togethers, graduations, rehearsal dinners, or just need lots of seating for that family reunion you’ve been wanting to have and nowhere to hold it. You can even bring cake and ice cream for your party and we’ll keep it in the freezer until you are ready to serve it. We welcome any suggestions on what you would like to see us carry on the menu. Come on by with your family and enjoy our friendly down home service you’ve come to expect from Rockhouse! Visit Rockhouse Pizza on Facebook. Read another Rockhouse Pizza in Robards, Ky Review on Genuine Kentucky to hear and see how amazing their bread sticks and strombolis are! The Feed Mill in Morganfield, Kentucky has some of the best fried catfish in the world. The entire world. The bottom line is this: The Feed Mill in Morganfield is one of the best restaurants in the entire state. I know, it bumfuzzles me too. Shouldn’t the state’s best restaurants all be in the larger towns? Shouldn’t they be restaurants that are household names? Shouldn’t they be the restaurants with names you instantly identify with the city it calls home? The pork chop was spectacular, on its own but if you ask for honey mustard on the side, you’ll want to dance beside your table. It’s the best honey mustard I’ve ever had. It has the same effect on my taste buds that yum yum sauce at Japanese restaurants have. It’s as though Angels from Heaven came down and made it. If only angels shared recipes. On our most recent trip (we go a lot… a whole lot), my husband and I were accompanied by our beautiful youngest daughter Stephany. She’s the biggest fan of ribs in the world and says The Feed Mill is home to the best she’s ever had. She’d know. She is to ribs what her mom is to catfish. Can you say obsessive stalker? 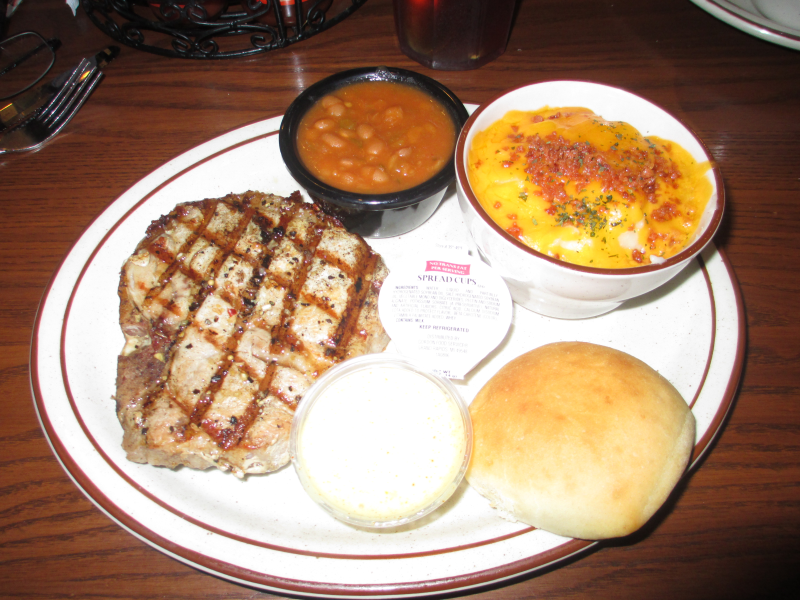 My husband ordered the pork chop (pictured above). It looked so incredibly juicy and delicious, I nearly had plate envy. Fortunately the adorable little server put my catfish in front of me just in time. Restaurants like The Feed Mill are exhausting for me. Everything is so darn good that you don’t know which to order. I’m always torn between steak, fried catfish, and fried chicken. Catfish is one of my reasons for living, so 3 times out of 4, that’s what I order. However, let me go on record as saying The Feed Mill has the best fried chicken you can get out. It’s like a religious experience it’s so good. Juicy on the inside, crispy and full of flavor on the outside. Oh my word, it’s just extraordinary and my mouth is watering just thinking about it. I’m pretty sure ordering fried chicken with a side of their ridiculously wonderful honey mustard would make a person pass out from joy. I believe I covered the amazing fried chicken in another review of The Feed Mill in Morganfield. Steph’s beloved BBQ Ribs, green beans, loaded mashed potatoes and yeast roll all smelled as wonderful as they looked. The Feed Mill’s ribs are never too dry and, somehow, manage to have more meat on them than most ribs do. As delicious as they are, that’s a very good thing. I’ve never had a meat, yet, at The Feed Mill that wasn’t beyond excellent. The servings are always generous, too – something that can be an issue these days.Ã?Â In the past 6 months, alone, I’ve come across 5 different restaurants (4 at dinnertime/2 at lunchtime) where it was OBVIOUS that the amount of food had been scaled back. Funny thing though, the price is never dropped. Hmmmm, funny how that works isn’t it. And by funny I mean I doubt I’ll go back. Some places like The Feed Mill (and Olive Garden to name another) keep giving generous portions in spite of the economy because they realize that we’re affected by it as much as they are. They don’t want to do wrong by the people who are doing right by them and, frankly, it makes me want to give them more of my business. In addition to generous servings, The Feed Mill’s sides are absolutely amazing. The mashed potatoes (loaded or unloaded), baked beans, green beans, etc. are each out of this world. So are their amazing onion rings. These onion rings are officially now the best in the state. These are what onion ring fanatics like me want their onion rings to look and taste like. One teeny, tiny little complaint, though. The ketchup served at The Feed Mill is blech. It’s one of those off-brands that are sold to restaurants and it’s just not the least bit good, to put it kindly. Here’s how you get around it: Put a little on your plate and add salt and pepper to it. It makes it a lot better. Better yet, do what we did and bring your own packets of Heinz or Hunts (or even Red Gold for crying out loud)! Fortunately, the onion rings are, honestly, so fantastic you won’t care about the ketchup. We always either order onion rings as an appetizer or one of their other appetizers: fried pickles, fried mushrooms or mozzarella sticks. Each is so incredibly delicious I’d have a hard time picking a favorite. My advice is to definitely order an appetizer – even if it’s just an order of onion rings to share. One other trick of a frequent dinner: If you order the catfish, replace the hush puppies with a roll. Trust Joi on this one. The yeast roll is 1,000 times better than the hush puppies. It’s not a knock so much against the hush puppies (which actually taste closer to yellow cake than hush puppies – not an entirely bad thing for cake lovers, eh?!) – it’s simply high praise for the rolls. For me, the test for excellent bread is when you don’t even bother with the butter. The Feed Mill’s rolls are that great. I’ve always wished they provided a basket of rolls a la Olive Garden, but it’s actually probably a good thing they don’t. I’d never leave. We’re always stumped over which amazing meat to order and perplexed over the appetizer choices. Even the sides take a little thinking through. Their green beans and baked beans are each some of the best beans you can get in any restaurant known to man, woman, or beast. There’s something extra special about the baked beans that I can’t quite put my finger on. They’re just stupid good. When it comes to dessert, at least the choice is easy. In all fairness, I don’t think we’ve ever ordered anything different. The Gourmet Bread Pudding with Bourbon Sauce is one of the best things I’ve ever put a fork into. The flavor simply cannot be described – you have to experience it for yourself. No doubt all of the desserts are good because everything (except the ketchup) is fantastic at The Feed Mill, but a better dessert doesn’t exist in the world than the Bread Pudding with Bourbon Sauce. I’m completely obsessed with it and could eat it for breakfast, lunch, and dinner every single day of the year and only complain that there aren’t more days in the year. I’m so in love with this dessert that this is the first time I’ve ever photographed it. I’ve always simply attacked it fork-first and never looked back. As the two desserts were sat on our table (one is perfect for 2 people), I grabbed my fork and was about to do major damage when I saw Stephany whip out her phone to take a picture. The Feed Mill’s Bread Pudding with Bourbon Sauce. If you covered a Volkswagen with this Bourbon Sauce, I’d find a way to eat it. She seemed so civilized at that moment and I seemed like such a barbarian. 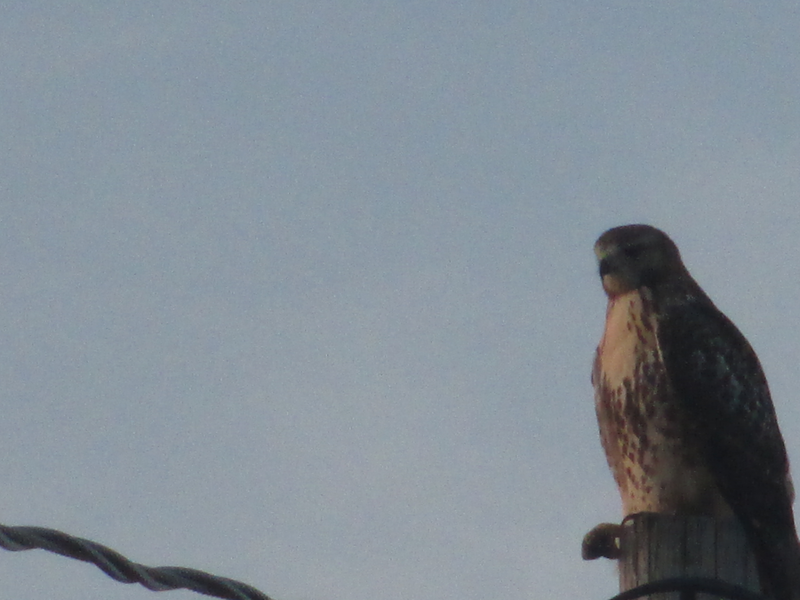 I squealed, “Good call!” and whipped out my camera. So here you have it. Thanks to Steph you now can gaze upon the wonder, the beauty, and the splendor of The Feed Mill’s Bread Pudding with Bourbon Sauce. Just promise me you’ll go to The Feed Mill and try this dessert for yourself. It’s unlike anything you’ve ever had. True story: When my husband first ordered it for dessert, I thought he’d lost his marbles. In fact I was so annoyed with him, I decided I wasn’t even going to help him find him. I thought, they’re your lost marbles, you find them. You screwed up something as magical as dessert and are officially on your own now. Seriously? Bread Pudding? Seriously. 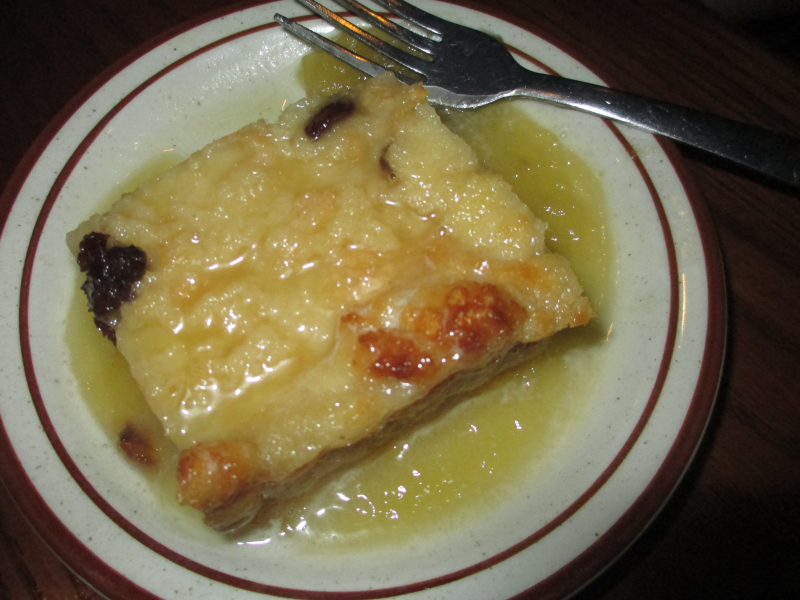 Bread Pudding. Or as I’ve come to call it, the Dessert of the Gods. I hope you’ll click through and check out The Feed Mill’s Menu, if your heart’s strong enough for that sort of thing. I’ve been dying to try them for lunch sometime – the lunch menu sounds incredible too. Two words: Just go. Okay, three. Just go please. I’m dying for you to have this experience! 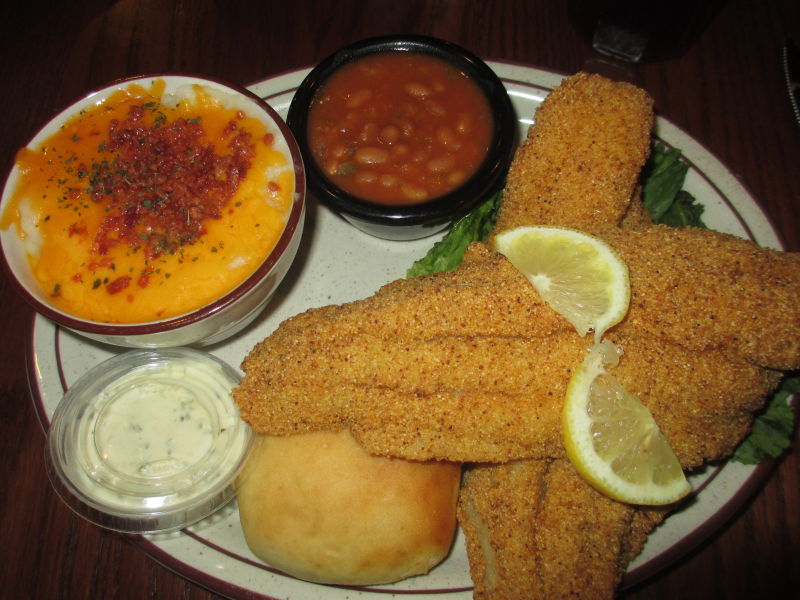 Feed Mill (Morganfield) Review: Some of the Best Fried Catfish on Earth! Fishermen (and women) love Buckhorn Lake State Resort Park (Buckhorn). Not only is Buckhorn Lake (a mountain reservoir lake) filled with largemouth and Kentucky bass, crappie, bluegill, and channel catfish, they can enjoy angling for muskie! large population of the predator fish lives in the lake. Buckhorn Lake State Resort Park (Buckhorn) is adjacent to beautiful Daniel Boone National Forest. Nesting eagles can be seen during winter months from the windows in the lodge or dining room at Buckhorn Lake State Resort Park (Buckhorn). Enjoy Elk Watching during tours at Buckhorn Lake State Resort Park (Buckhorn). Click the link to check for times and dates. Taylorsville Lake State Park (Taylsorsville) is the most heavily stocked lake for fishing in Kentucky. For a state that takes great, great pride in all of its lakes and the excellent fishing Kentucky’s known for, that’s really saying something! Taylorsville Lake State Park (Taylsorsville) is named after the town of the same name. Taylorsville was named in honor of President Zachary Taylor’s father, Richard Taylor, who donated 60 acres of his own land for creation of the town. Nolin Lake State Park (Bee Spring) is one of the Kentucky State Park System’s newest parks. It opened in 1996. This is the perfect (PERFECT) place to enjoy quiet camping, hiking, or fishing. During the week, you’ll find all the solitude you could hope for. The excellent golf course at General Burnside State Park (Burnside) is considered by most to be the best golf course in the Lake Cumberland area. Fishtrap Lake State Park (Pikeville) is home to Fishtrap Lake Dam, the highest dam in the state (a staggering 195 feet!). Fishtrap Lake was created to help control flooding along the Ohio and Big Sandy Rivers. The Army Corp of Engineers began in 1962, and President Lyndon Johnson dedicated the project upon its completion in 1968. Kingdom Come State Park, with an elevation of 2,700 feet, is the crowning jewel in the crest of Pine Mountain. Named after the popular Civil War novel, “The Little Shepherd of Kingdom Come,” by Kentucky author John Fox Jr.
My morning routine is one you’d expect from an animal and bird loving coffee addict. My inside cat, Alexa, wakes me up usually around 5:30. By the grace of God, I make it to the kitchen where I feed her while simultaneously turning on the coffee maker. An art form perfected over the years. While Alexa eats (as though she hasn’t eaten in months) and the coffee fills the kitchen with a Heavenly aroma, I gather up bird seed, fresh water, cat food, peanuts, dried corn, sunflower seeds and whatever else may be needed in the great outdoors. I feed my outside cats (Queen Fatima and Hannah) who always seem to be exhausted from their evening activities – I don’t judge them. They’re single. I fill their water bowls with fresh water and a little ice…. they like that in the summer. As Fatima (a feral cat I turned into a big baby) and Hannah eat and drink, I make my way to the different squirrel and bird feeding stations in our yard. I say squirrel and bird because they’re in the yard almost constantly, but rabbits, skunks, raccoons, possums, and even coyotes and deer have been known to think of our yard as their own personal kitchen. In fact, an adorable little skunk family is in our yard almost as much as the squirrels. Smelly little cusses when they get riled up, but so cute they’re worth it. This morning, as I was filling the squirrel’s feeder with cracked corn and sunflower seeds, I wondered why they weren’t nearby. Usually the squirrels are waiting for me each morning. When I heard a crazy scream overhead, I realized why they were hiding out. 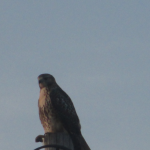 The cardinals and doves that were focusing intently on their breakfast scattered as I looked up to see a really big, beautiful hawk gliding over us. The sounds she made could only be described as screams. 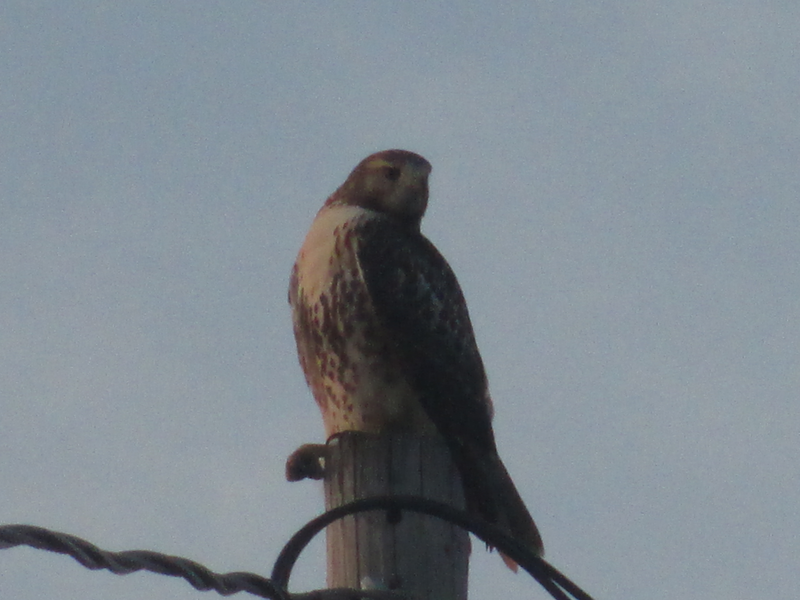 She landed on a large phone pole behind our house. I made her promise to stay put while I ran in for my camera. After 2 cups, I’m invincible. 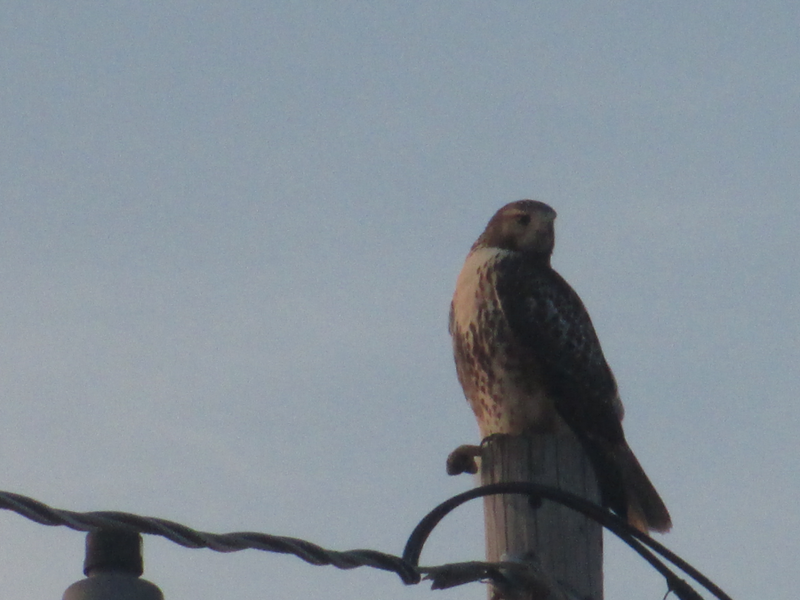 I’m also ridiculously in love with and excited by animals and birds, so the fact that I even attempted to photograph this beauty instead of just gawking at her is huge for me. 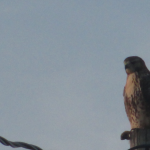 I’d have been a hawk gawker, and it wouldn’t have been the first time. 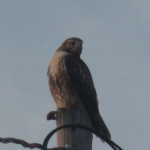 I’ve looked through my bird books and checked websites that I trust, but I”m still not 100 percent sure what type of hawk this is. 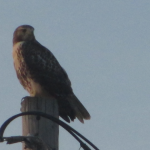 After posting these pictures, I’m going to contact Geoff Roberts, Rough River Dam State Resort Park’s Program Services Leader, Naturalist, Fisherman, Bird Expert, and all around super nice guy. 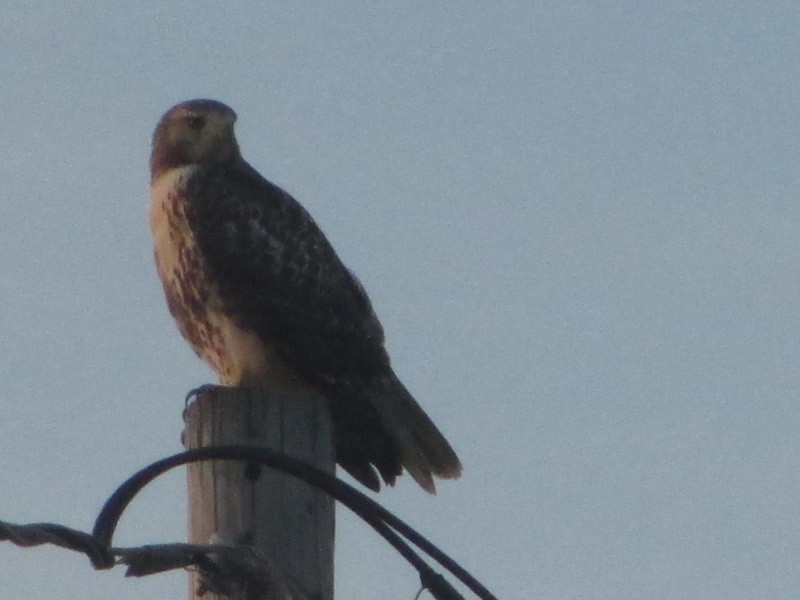 If anyone can tell what type of hawk this big beauty is, he can. The only problem is, my pictures may not give him much to go on – after all I didn’t climb a car or anything. Cursed hindsight! If he’s able to identify her, I’ll come back and edit this post. EDIT: He knew… as I knew he would! 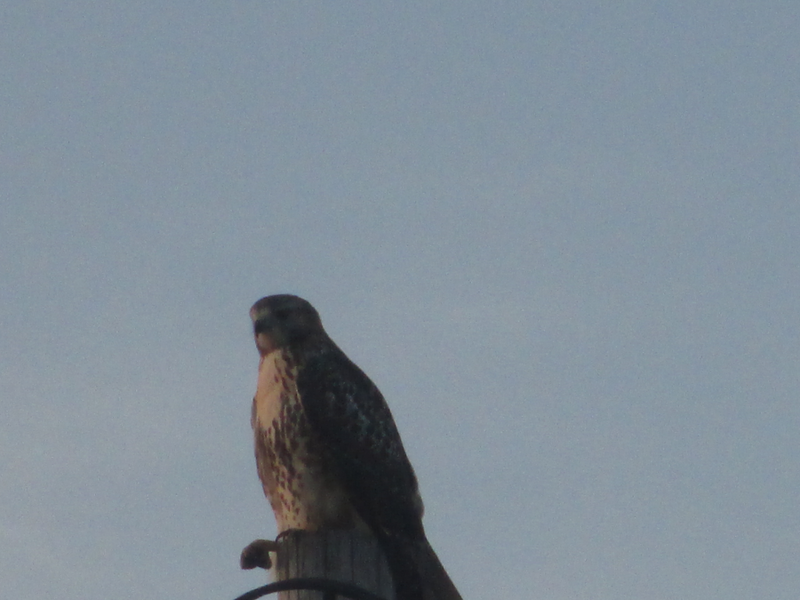 She’s a Red Tailed Hawk.